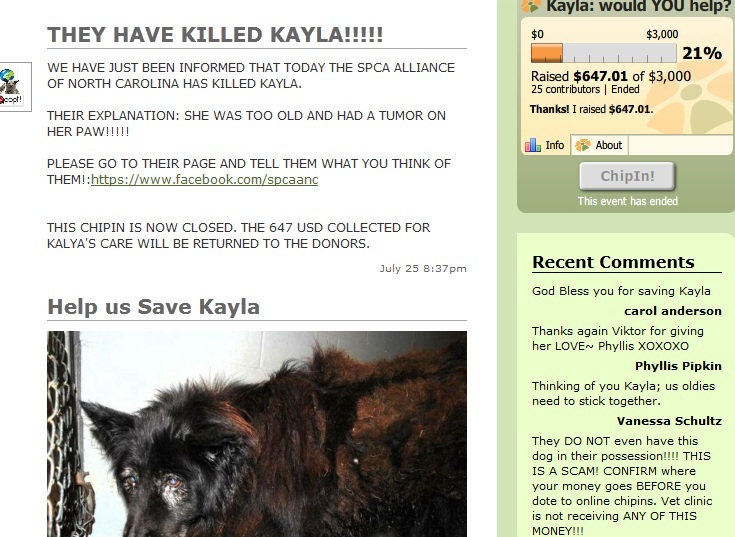 This ChipIn effort raises one significant question : "If Kayla the dog was in the hands of Let's Adopt! Global's veterinarian and being treated, how on earth did she end up back in the hands of the North Carolina shelter?" Am I missing something here? Was Kayla one of those magical dogs who had the unique ability to be in two places at once? On its own blog, Lets Adopt! Global clearly states the they had possession of Kayla. Why, when I attempt to ask questions that any person who cares about the welfare of animals would ask, do I get accused of slander? There is nothing slanderous about this post. I am sharing information that Let's Adopt! Global has already offered via its own outlets. As it stands, while I am terribly concerned about the inconsistencies in the daily operations of Let's Adopt Global, I am now becoming increasingly concerned for those individuals who still see fit to blindly ignore said inconsistencies. In my previous post I did receive a response from an individual who represented themselves as a Vice President from Let's Adopt! Global. Here is that comment along with my reply. "I would ask you to please check what you think are facts. Everything you have posted here is false. You are writing a Libelous article and basing all this on just what you have read on the interent. I can tell you what you have written here is a Lie. I can tell you because I am an officer of this rescue...yes. that's right. I am a Vice President of Let's Adopt!Global. 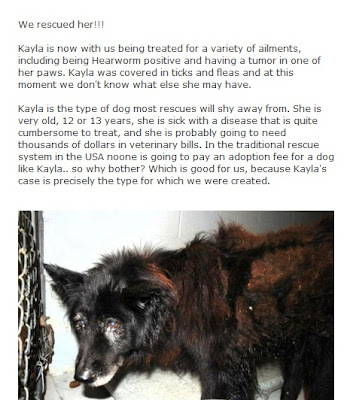 A world wide rescue organization, registered in MA. USA. I wonder if you operate in your daily life so blindly. You read Libel on the internet and you see fit to repeat it, without checking your facts. With no regard to the letter of the law regarding Libel, Slander and Defamation. Perhaps the laws are not the same in Canada?...no they are the same." **The problem is the things I read on the internet are bullying comments by Let's Adopt Global. "I'm glad somebody from Lets Adopt! Global has responded, now I can get some more info. First off if you'll read the statement, "Or is the organization facing unfounded charges from a group with a grudge? ", I assume that is not one of the lies to which you are referring. I reported on what I had read, clearly stated that it might not be so, stated the issue deserves more attention and, and reported on the FACT that the page is blocked in Canada. People are so gung ho to scream libel nowadays, even when it is clearly not the case. If you have an official response that addresses the above concerns, I welcome such a response and will publish on the blog as well. Why can Canadians not view the Facebook page? I would hope any large rescue would welcome any readers and potential donors, regardless of country of origin, with open arms. What actions does Let's Adopt! Global take if a representative is discovered to be pocketing funds from fraudulent ChipIn accounts?" I look forward to an official response so I can publish a statement on behalf of Let's Adopt! Global." "In further reply to Guest (will ANYONE involved with Let's Adopt! Global provide a real name if there is nothing to hide? ), I have just noticed that on the Let's Adopt! Global blog, there is a "blacklist" provided....."We will not enter into public discussions on the reasons why the people in the list are blacklisted. One thing you can be sure of though.. IF YOU SEE SOMEONES NAME YOU SHOULD NOT, UNDER ANY CIRCUMSTANCE, GIVE THAT PERSON AN ANIMAL, DOG, CAT, PARROT, RAT, FISH…". Then at least 35 names (some with personal emails) are displayed. I'd like to know if this falls under your definition of slander, be it in Canada or any other country?" Here's the deal. I have nothing personal against Let's Adopt! Global. I do not know any of its administrators, have never been in contact with them (attempts have proved fruitless), and have no personal grudge against the organization. I have stated that some or all of this could be untrue. To Let's Adopt! Global supporters, I recommend that instead of spending your time accusing anybody who questions the practices within the organization with slander, instead you may want to consider writing to Let's Adopt Global asking for a reply. Here's hoping you have more luck than me. A word of warning though, if you do so in all likelihood you will be banned from the Facebook page. I will continue to pose questions. That is my right. I am not posing these questions to hurt what I'm sure is a tremendous number of well intentioned people who support Let's Adopt! Global. I am posing them on behalf of the animals, some of whom may be suffering at the hands of one or a select few within the organization.